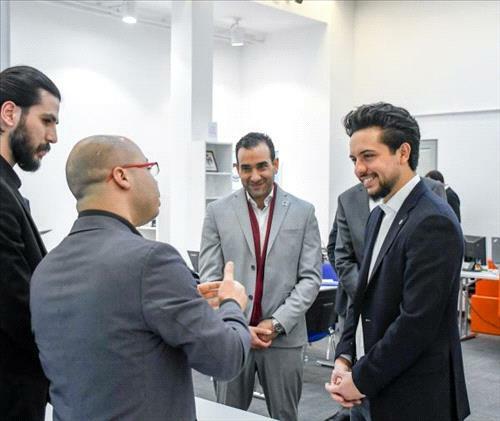 AMMONNEWS - His Royal Highness Crown Prince Al Hussein bin Abdullah II visited Al Hussein Technical University’s Centre for Innovation and Entrepreneurial Excellence on Wednesday and was briefed on its activities to promote and empower youth innovation through applied technical education. The centre seeks to address labour market needs while building students’ capacities by offering support to start-ups. During the visit, Crown Prince Al Hussein stressed the need to support young creative Jordanians and their innovative ideas to turn them into productive projects. His Royal Highness commended the courses and programmes offered by the centre. The Crown Prince also toured the centre’s facilities and was briefed on a programme to train and employ ICT graduates, implemented in cooperation with the Ministry of Information and Communications Technology, with support from the Employment-Technical and Vocational Education and Training Fund. The programme seeks to provide two-year training for 1,000 university graduates with bachelor’s degrees in computer and telecom engineering, computer science, and computer information systems. The centre’s director, Yazan Hijazi, gave a briefing on its vision, adding that it holds intensive training courses for entrepreneurs on how to plan and start a business. His Royal Highness spoke to a number of youths participating in a course on innovation, who highlighted the skills they gained through training. The Crown Prince was also shown products related to renewable energy, digital games, and artificial intelligence, designed by a number of start-ups incubated at the centre.